The following is a contribution about self-discipline from Eric Olson, Owner of Windmill Creek Studios. Self-discipline is easy when you’re committed. You want to do the work, can’t wait to do it. People ply you with diversions but you’re a bulldozer of intention. Time stands still and you come out of the zone hours later, as if it were minutes. This is the dream. The only problem is how to become committed. It seems easy at first; you “just decide.” You begin. But things come up. Plans never quite work out. The will is drained. For many people, this is the reality. What goes on here? What is the force preventing the insurance adjuster from becoming a successful painter? What blocks the lawyer from becoming a songwriter? Why does the bus driver drive a lifetime away instead of becoming the organic farmer she really wants to be? In The War of Art, author Steven Pressfield calls it Resistance. He says, “Resistance by definition is self-sabotage…the most toxic force on the planet.” The devil lies within. But if we can overcome this demon, we break the shackles preventing us from being the person we’re meant to be. As we all know, this rarely happens – but some people manage it. How? Sometime, ask an artist if they feel alone in the studio, at the typewriter, in the darkroom. Most artists will react with a surprised “No!” When we’re working we’re not alone. We’re in a world of imagination, working with colors and ideas and characters that form as if they are alive. It’s not easy to be an artist. There is the training, which can steal more years than becoming a doctor. There are the lonely voyages of self-discovery, the false starts and blind alleys. There can be ostracism, and doubts poured like boiling pitch on new ideas. Money is nearly always a problem, and so is the struggle for acceptance. The artist endures all this and more in her journey. If she sticks to it, through all these trials, something evolves. The artist gives form to that magical source of inspiration, illumination, challenge and delight that is art. The secret is commitment. When commitment is made, barriers come down, doors open, a mystical synchronicity happens. Resistance disappears. 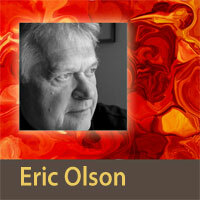 Eric Olson began his formal training at Pratt Institute in 1966, where he studied Industrial Design under Etan Manasse. During the next 24 years Olson developed numerous award-winning products, pac kaging, graphics and websites for clients such as IBM, Vivitar, Mobil Oil, and Nakamichi America. Eric turned to fine art photography in 2003 and has exhibited frequently in the East Coast. Eric’s goal is to share complex feelings in visual form that others can perceive intuitively. His works have been exhibited in the USA and Europe, and are found in private and corporate collections, as well as contemporary art galleries and museums. This entry was posted in business owners, Entrepreneurs, Management, self-discipline and tagged Eric Olson. Bookmark the permalink.